Check out the photography equipment page to see the recommended gear list for night photography. Photographs that seem to bend the reality of what we can see with our naked eye, have a certain allure to them. 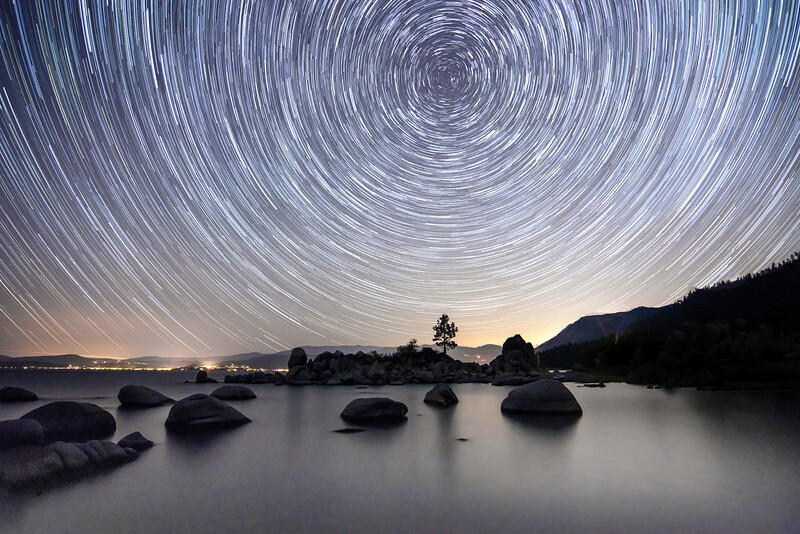 Most notably, time-lapse or extended release photography, where it becomes possible to intentionally blur moving subjects, turn bodies of water into silk, and see the progression of stars as they move through the sky. 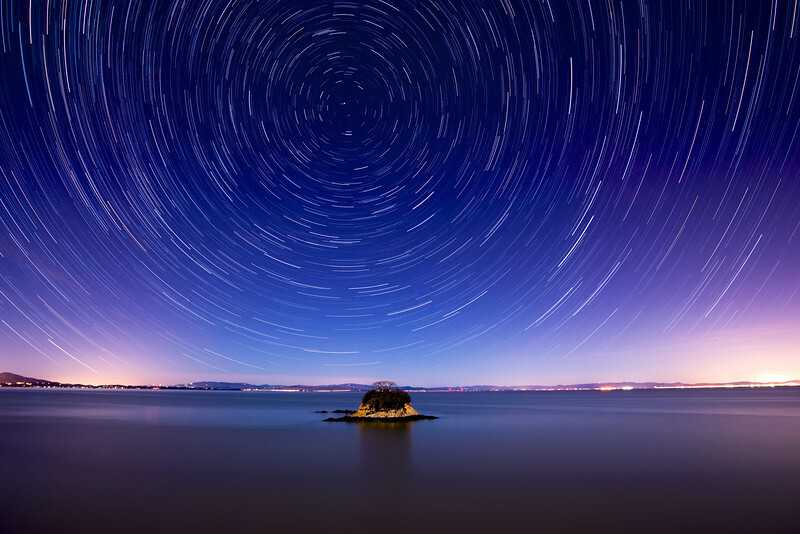 With this shot, China Camp Star Trails, this was my first truly successful attempt at achieving what I was looking for. Although I had been trying to capture the celestial sphere for years, this was my first time using a very specific technique that I have found to be incredibly useful. 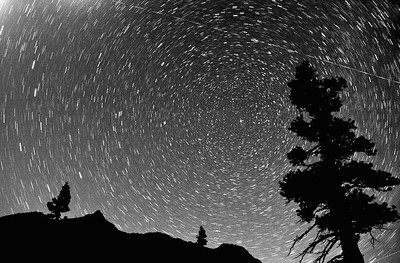 The following star trail photography tutorial is a culmination of lots of research, and even more trial and error. A DSLR. This is crucial in order to be able to set shutter speed to manual. A Solid Tripod for night photography. This might seem self-explanatory, but you would be surprised how many people feel they can get away without one. You need something that will remain stable over long periods of time, and won't be swayed by gusts of wind. A fast lens with manual focus. Your camera's autofocus won't work well at night, you need to establish in advance (preferably in the day time) where your lenses optimum infinity focus is. Note that it is usually not all the way to the edge, but rather just before it. A shutter release remote. This is crucial to avoid the shake from pressing on the shutter, and to be able to lock the shutter open for continuous release. Make sure to set the camera/lens to manual focus (as previously described). Aperture should be set to the widest possible (2.8 works best). ISO will need to be bumped up significantly. I find that around 1600 works well without compromising image quality. Shutter release needs to be set to continuous, and manually set to 30 seconds exposure. Using the shutter release cable, take a single test exposure to make sure that your settings and composition are the way you want them. In your viewfinder, zoom all the way in to a single star to make sure that it is sharp and in focus. Once everything looks the way you want it to, use the shutter release remote to lock the shutter open. The camera will shoot a 30 second long exposure, and then immediately and continuously shoot the next one. Allow your camera to operate and do its thing for anywhere from 1-3 hours (or longer). You will end up with possibly hundreds of individual 30 second exposure shots. On their own, they won't look like much, but don't worry, that's where the post-processing comes into play. Open up all of your RAW files in your favorite program for editing RAW files. I use Lightroom, it's perfect for creating batch-changes to a large group of photos. Do some editing to the first photo, reducing shadows, shifting the white and black points, noise reduction, lens correction, etc. Nothing too dramatic. Then synch or apply those settings to the entire collection. Next, export as high quality Tiff files to a folder on your computer. This process will take a very long time (possibly a few hours). Once complete, open up a Stacking software (my favorite is StarStax). Use the program to upload all of your recently created Tiff files, and begin processing. You can chose what extension to save it as (either JPEG or Tiff). And then voila, you are done. 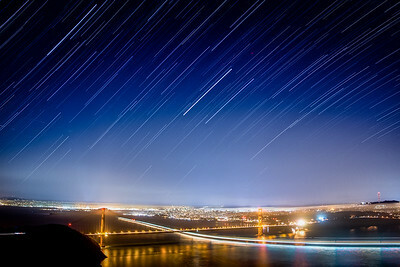 What you should have is a single image with star trails. It's definitely not something you will perfect on your first try, but the wait time, patience, and very cold weather will definitely pay off when you get that incredible shot. I have found this method to be infinitely better than simply taking a single long exposure. For more in-depth explanations of all the fundamentals behind this technique, I would recommend reading this article on great courses to develop your landscape photography skills. 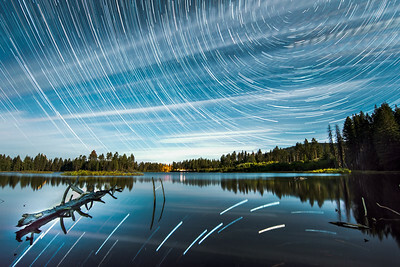 Check out the images below to see more successful examples of the star stacking technique. Enjoy! 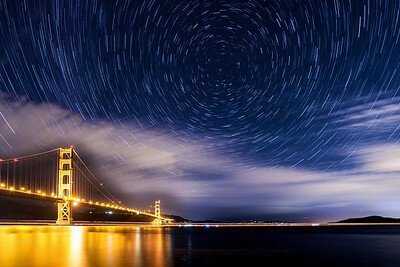 Feel free to let me know your thoughts, suggestions, or questions about this process; or submit your own star trails photo taken using this technique.